Posted in Miscellaneous, Salads, on December 1st, 2018. A really simple salad to serve with a holiday meal – or more likely with Thanksgiving turkey. As it happened, I was watching The Pioneer Woman last week, and she showed something similar to this salad above, that was her mother-in-law’s standard for Thanksgiving. Her MIL passed away recently, so Ree was making this salad in homage to Nan. It reminded me of a salad I had once upon a time, years and years ago and really liked, and never found out who made it, to acquire the recipe. 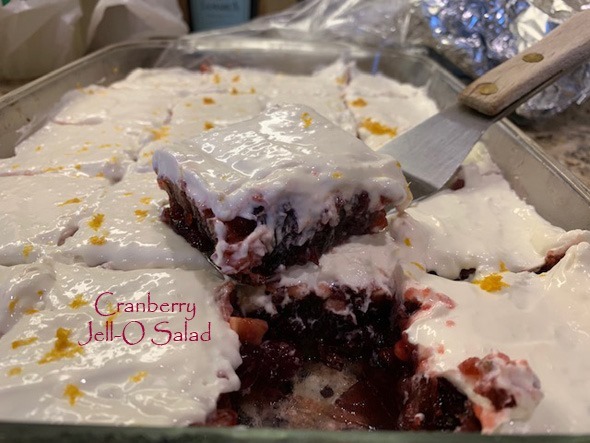 So, first off – if you follow the recipe – you need to find cranberry Jell-O. Well, that proved an impossible task in the days leading up to Thanksgiving. Supposedly Target has it, but perhaps it’s only available online. I gave up looking after visiting 3 grocery stores + Target. So I bought Black Cherry Jell-O and used that instead. First you make the underneath gelatin part – adding 2 cans of whole cranberry sauce and a 6-ounce can of crushed pineapple (drained). I also added about 2/3 cup of chopped walnuts (my addition to the recipe because walnuts were in the salad I remember from long ago). That was chilled until set (overnight in my case). Then, I started on the topping. Ree said to add 1 1/4 cups of milk to an 8-ounce package of cream cheese. That seems like too much to me, so I added just 1/2 cup and spread that all over the top of the chilled Jell-O. Then I microplaned some fresh orange zest on top (in Ree’s recipe). I covered it with plastic wrap (elevated above the cream cheese) and chilled that until we were ready to eat. Was it up to my expectations? Absolutely. I loved it. And I shouldn’t have had any of it (not on my no-sugar, no-carb diet) but I ate it anyway. AND, I had a serving of it the next day when we had leftovers. By then it was nearly gone. What’s GOOD: love-loved it in every way possible. Sweet, tart, piquant, satisfying, easy. What more could you want? What’s NOT: really nothing. It was a great addition to the Thanksgiving table. 1. Bring 2 cups of water to a boil, then remove from the heat. Stir in the gelatin until completely dissolved, 1 to 2 minutes. Add 1 cup cold water, the cranberry sauce, chopped walnuts and pineapple. Mix well, ensuring you break apart any large chunks of the cranberry sauce. 2. Pour into a 9-by-13-inch glass dish. Cover and place in the refrigerator until firm, 3 1/2 to 4 hours. 3. Beat together the cream cheese and powdered sugar with a hand mixer until smooth, about 1 minute. Add the milk and mix until completely combined. Carefully spread the cream cheese frosting in a thin layer over the cranberry sauce. Zest the orange directly over the frosting. Can be chilled (covered in plastic wrap, but elevated up above the cream cheese) overnight. Serve in individual squares. Per Serving: 365 Calories; 11g Fat (25.8% calories from fat); 8g Protein; 63g Carbohydrate; 1g Dietary Fiber; 22mg Cholesterol; 225mg Sodium.